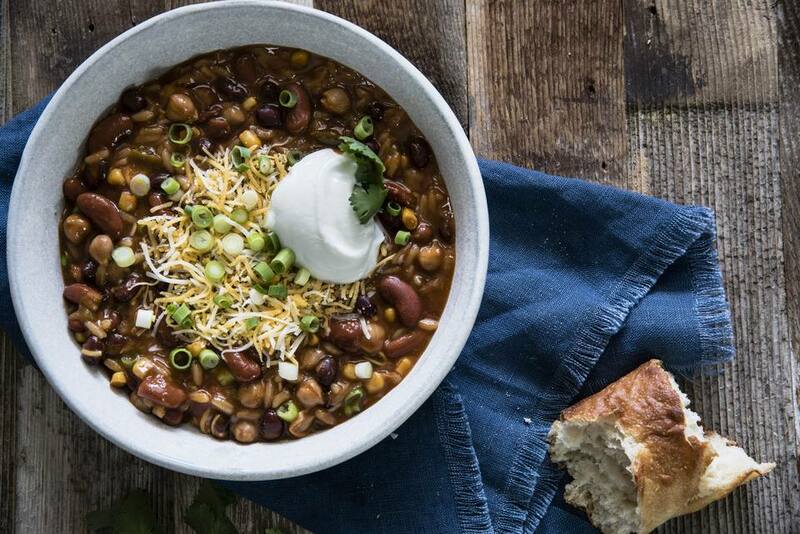 Who doesn't love a good vegetarian black bean chili recipe? Made with mostly canned ingredients, this a quick and easy vegetarian black bean chili recipe that's perfect even for novice chefs. Give it a try—it's practically foolproof! Omit the cheese and optional sour cream topping if you need it to be vegan and dairy-free as well. First, heat half the oil (one tablespoon) in a large saucepan over medium-high heat. Add the cut tortillas and lightly brown. Remove to a paper-towel-lined plate; let drain. These tortilla strips will top your chili and give it a fantastically crunchy finishing touch. Next, heat the remaining oil (one tablespoon) in the same large saucepan. Add the onion, red pepper, garlic, and corn. Then stir in the chili powder, oregano, cumin, and cayenne pepper. Allow cooking for four minutes, stirring often. Next, add the beans and tomato sauce. Season with a bit of salt and pepper to taste. Allow to simmer over medium-low heat for 20 minutes. Serve your black bean and corn chili topped with tortilla strips, cheese, green onions, sour cream, and cilantro.